Originally published by the Pilot Magazine on January 2018. Download printed version here. Originally published by Eat, Sleep, Love, Travel Blog on November 2017. Originally published by The Sun Fabulous on November 2017. Download printed version here. Originally published by The Diary of a Jewellery Lover blog, November 2017. If you have ever wondered what was going on in the cockpit of a modern jet as you relax at the back with a gin and tonic then you now have the chance to find out for yourself. Flight Experience London offers a range of flight simulator experiences that will give you a unique insight into what happens in the cockpit during take-off and landing. I visited Flight Experience London recently to try my hand at flying a Boeing 737-800. The simulator is in a smart, modern building a few minutes stroll from East Putney Tube station. On arrival you watch a short video which is an introduction to the actual simulator experience itself. The simulator is a replica of a full size Boeing 737-800 cockpit made with genuine parts and it’s been officially approved by Boeing. My lesson started with my highly enthusiast instructor describing the controls, switches and displays, and there were a lot of them. I learnt about the throttle which controls engine speed, the flaps which give extra lift during take off and landing, ascending and turning with the yoke, how to raise and lower the landing gear, the rudder pedals for steering under power on the ground and the trim which assists stable flight and maintains the aircraft’s centre of gravity. Sat at the end of the runway at Heathrow with very realistic looking terrain in front of me was highly exciting. I wound the engines up to 4000RPM, pressed a black button on the throttle and we rapidly gained speed. At the command V1 from the pilot indicating take-off speed had been reached I pulled back on the yoke watching the artificial horizon indicator showing a 15 degree climb and my heart skipped a beat as we became airborne. It was a busy time just after take-off, the flaps were retracted and the landing gear raised. We were going to fly around the airport and land back at Heathrow. With Battersea Power station and Canary Wharf ahead we made our final turn into the landing. Again there were flaps to extend, engine speed to set and landing gear to lower. A voice in the cockpit counted down the altitude, at 30 feet above the runway I cut the engines, pulled the yoke back half an inch and once on the ground engaged reverse thrust to slow down. Even this little flight had been a thrilling and exhilarating experience. I had found myself totally concentrating on all the controls and felt comfortable with my understanding of them. Travelling across the world we were then sat on the tarmac of Hong Kong International and would be making the notoriously difficult landing at Kai Tak airport in Hong Kong harbour. This was a lot more tricky, having to make a sharp right turn just before a block of flats. I managed to land OK but then committed my only faux pas, running over the grass on the taxi way. After what I can only describe as a unique and rewarding experience I spoke with co-founder Nick Taylor about Flight Experience London. He outlined the various flight experiences that were available, you can fly from London to Paris for example or do a segment of a long haul route. There is is also a fly/dine package run in conjunction with a local restaurant. For the nervous traveller there is a fear of flying course which includes a consultation with a therapist to get to the root cause of the problem. Corporate events and team building exercises are popular with the possibility of a ‘Pilot Down’ scenario where you have to land on your own using an emergency phone for instructions. The simulator is also available for more serious flyers who may use it as a primer before applying for a job in the aviation industry or for professional pilots preparing for their annual assessment. I flew in clear, still conditions but the simulator can create many different problems like multi-level cloud formations and even an engine fire. 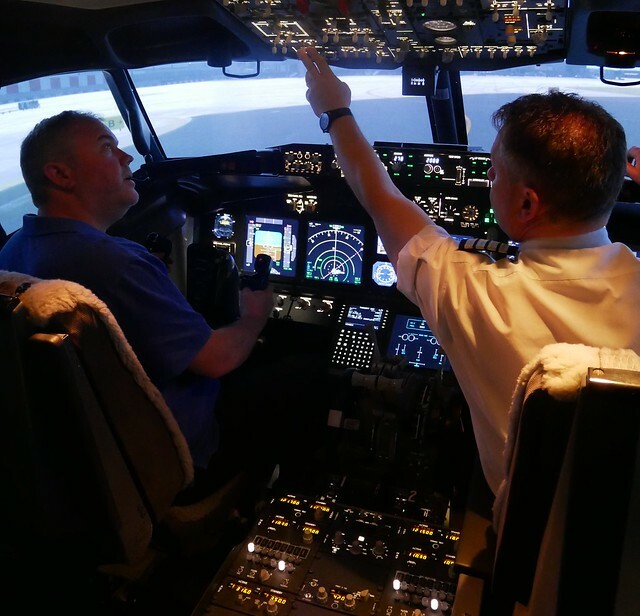 Flight Experience London will soon be taking delivery of an Airbus 320 simulator which will increase the facility’s appeal to even more people. I thought that this was a superb experience and found it thoroughly absorbing, gift vouchers are available so it would make an ideal gift for older children and anyone who was curious about the mysteries of flying. Post Originally published on About My Generation. The world’s leading flight simulator has landed in London (Putney to be exact) and offers a fun – and very realistic – opportunity to get in front of the controls in an actual Boeing 737 cockpit and see what it’s like to fly a commercial jet airliner. I booked a session at Flight Experience recently and had such a good time. And even though I was well aware that I was only there for a bit of fun once I was in the pilot’s seat the pressure was on and the simulation felt and looked real. The state-of-the-art flight simulator was a full-scale repurposed cockpit with high definition 180° panoramic visuals, changeable weather and day/night conditions and augmented sounds and vibrations. You can choose from 24,000 airports to “fly” in or out off. 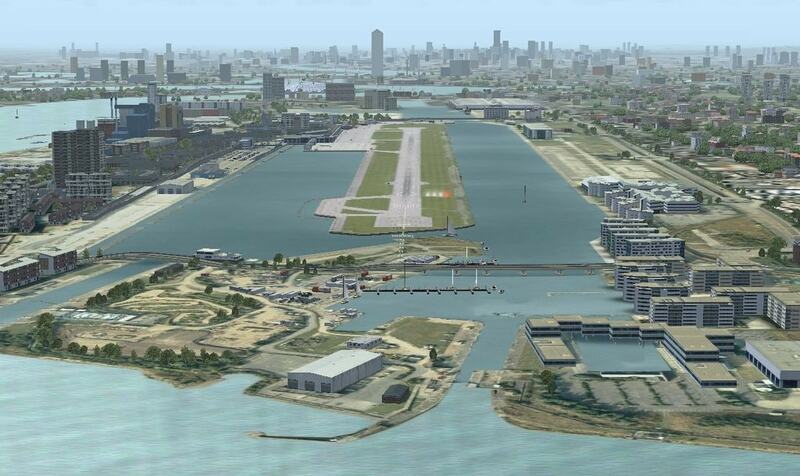 I choose Heathrow for my 30-minute simulation. I was impressed with the graphics and the “views” of London I got to take in before prepping for my descent. My copilot and instructor, Paul Kendrick (a profession pilot himself and cofounder of Flight Experience London), was brilliant at talking me through all the steps from takeoff to landing, using laypeople speak but (as far as I could tell) not dumbing things down for me. 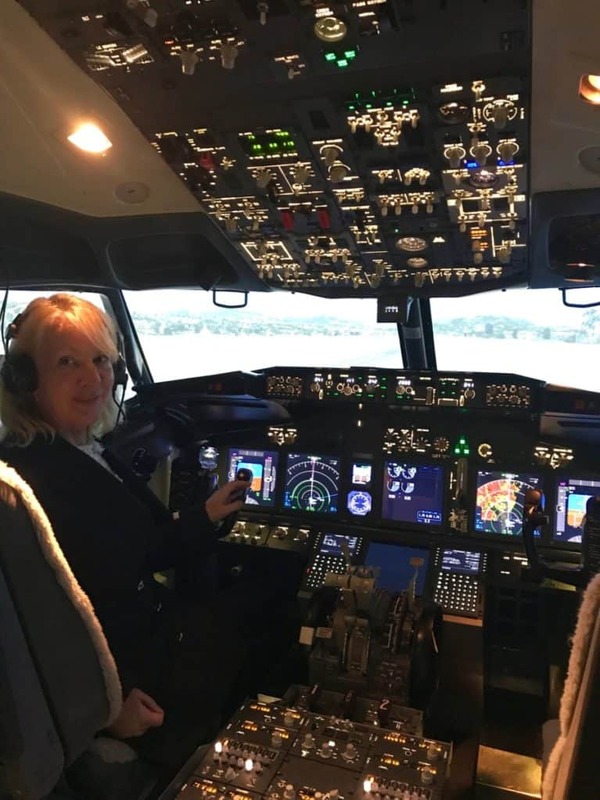 I’d recommend a Flight Experience simulation to just about anybody – whether you’re wondering if you’d like to pursue a career in air travel, you fly a lot and wonder what’s going on at the front of the plane while you’re in flight, or you’re a big toys and gadgets geek eager to find out how jets work. Cofounder Nick Taylor (who has more than 30 years of operational and senior management experience in the aviation industry) said that 14 is generally the youngest age they tend to accept for booking simulations. But that age is just a rule of thumb. If you know a child that’s really into planes or dreams of one day being a pilot, it’s worth getting in touch about booking a session. In addition to simulations for entertainment, Flight Experience runs psychologist-led sessions for people trying to overcome a fear of flying. Prices start at £109 for a 30-minute “scenic flight” package. Flight Experience London also operates Groundschool London from the same Putney premises with courses and programs designed to help launch careers in air travel. Options include a Pilot Foundation Course, a Future Pilots Programme, and a variety of foundation courses and more. Flight Experience London is located at 129 Upper Richmond Road, SW15 2TX. Find out more at london.flightexperience.co.uk and groundschoollondon.com. Post Originally published by tikichris on Tikichris. Flight Experience London = I’m flying a Boeing 737! Flight Experience London. Have you ever flown an airplane? Would you like to have ago? Well, this is for you! Regular readers know that I love to try new things and was super excited to actually Captain a Boeing 737 simulator. Flight Experience London is based in Putney in a very cool, modern office. The Thames is at the bottom of Putney High Street, so you can arrive by river bus if you wish. I drove and parked in the multi story car park just off the High Street which was very convenient. The Flight Centre is a super chic building and the simulator is constructed from the real cockpit of a real, licenced Boeing 737 plane. My experience started with an explanation of the various bits of equipment inside the flight deck and then a choice of where to take off and land. Choose to land in two destinations. My choice was JFK and Nice airport. Then you have the chance to take off and land by yourself, with help from your co-pilot, of course! Here are two videos of me flying toward JFK and landing in JFK. Landing for the first time was such a thrill. This is a perfect opportunity to experience the thrill of flying. The company organise training nights, product launches, client entertainment and team building. If you want to book an appointment for yourself when you are in London just call the number at the bottom of the page. 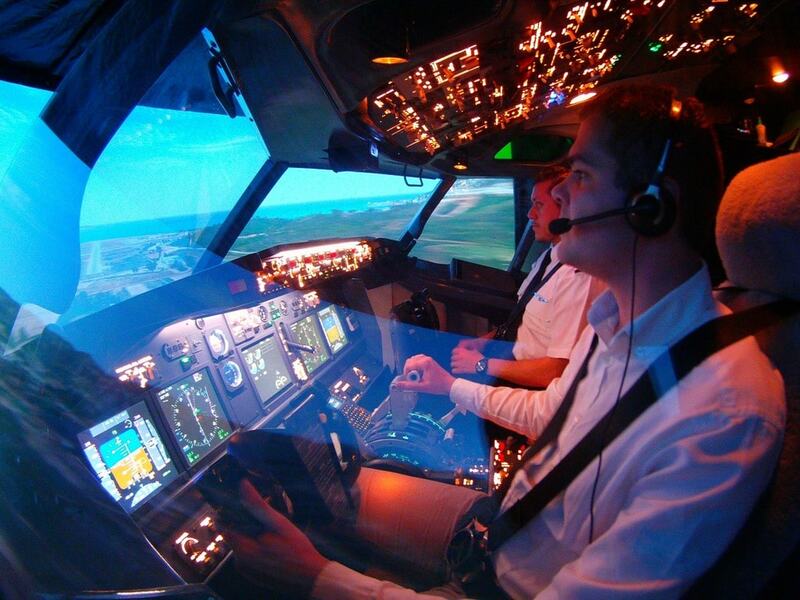 You will be flying an official Boeing 737 licensed simulator and have the real life experience of flying a plane. The team are very friendly and make it a fun flight! My friends all want to have a go now too and I will be back for another go for sure! The Flight Centre also work with schools to encourage young people to take up a career in flying, help future pilots prepare for flight exams and conduct annual flight tests for pilots so they are a very professional and experienced team. Post Originally published on Luxury Travel Diva. Flight Experience London is offering wannabe pilots, aviation enthusiasts and curious wanderlusters the opportunity to take to the skies in its state-of-the-art Boeing simulator. The centre, based in Putney, is easy to reach on the London Underground and home to one of the world’s most realistic flight simulators, built and flown over all the way from New Zealand. Once inside the cockpit, the feeling of immersion is incredible, with high-resolution surround displays giving you the feeling of being on the runway. The instruments are all made of the same materials and to the exact specifications of an actual Boeing and behave in the same way as if you were really flying. Each flight is accompanied by a professional instructor and former Boeing pilot, so everyone from first-time fliers to experienced enthusiasts will feel at ease. When Culture Trip tried the experience first hand, we flew a circuit around Zurich taking in the beautiful mountain views. Things then went up a gear when, after a few clicks, we found ourselves approaching Hong Kong’s now abandoned Kai Tak Airport with a treacherous right-hand turn to make before landing. In the hands of experienced former pilot Nick, Culture Trip managed the landing, known as a ‘captain-only approach’ for its difficulty. Undoubtedly the best flight simulator in the capital, London Flight Experience lets you take to the skies without ever leaving the ground. Half an hour in the simulator with a trained Boeing instructor starts from £140 (now on sale for £109); £195 for 45 minutes (sale price £159); and £270 (now £199) for the full hour. Head to london.flightexperience.co.uk for more info. Post Originally published by Alex Jordan on The Culture Trip. Originally published by The Oxford Times newspaper, 17 August 2017. Originally published by Oxfordshire Limited Edition Magazine, August 2017.